The Cloud is still a very big buzzword these days. Almost every business we talk to is interested in hearing more about The Cloud, and how they can use it to help their business. But the truth is the Cloud is not right for every company. In some cases, it actually makes much more sense for a business’ bottom line NOT to go to the cloud. So the question now is how can you tell if the Cloud is right for your company? First, let’s review a few different ways that you can use the Cloud in a business setting. You can have all of your data stored in the cloud and use a cloud based program such as Dropbox or Egnyte to manage it. To learn more about all the different Cloud-based file storage and sharing programs, read this blog post. Next, you can choose to only have some aspects of your business in the Cloud, such as email. By using a program like Gmail, or Hosted Exchange, you can set it up so your company email is accessible from anywhere with an internet connection. Or, you can choose not to put anything in the cloud, and instead use local file storage and on-site devices to manage your company data. It’s true that using the Cloud to manage your data, email, etc. seems like the better choice. You have more flexibility and ease of use when it comes to teleworking, which means you are not reliant on your office building to keep your company running. This can be especially important during major storms or snow days. When you use the Cloud you also don’t have to worry about taking care of all the physical devices- that’s someone else’s responsibility. You don’t need to spend time cleaning it, maintaining room temperature, checking when it’s time to replace it, etc. Instead, you can spend that time and money focusing on other aspects of your business. So, Why Don’t I Want The Cloud? It seems like there really is no reason not to use the Cloud for your business, and in many cases that is true. The Cloud programs available provide flexibility and peace of mind that don’t necessarily come with an on-premise device. However, being a business, one of the things you need to be concerned with is the bottom line, and this is where it sometimes makes more sense not to use the Cloud. 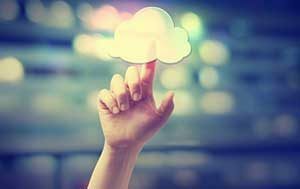 For small companies, using the Cloud is a great solution. It is much more cost-effective to use Cloud-based programs then to have your own devices. But, if you are a large company, it actually might make more financial sense to have your own devices instead of using Cloud-based programs. Using the Cloud can actually end up hurting your business’s bottom line instead of helping it. Most Cloud-based programs run on a subscription basis- you pay per employee per month. For a small business, one with less than 50 employees, this subscription payment plan is going to work really well. But, if you have over 50 employees, buying and managing your own server might actually end up saving you money- you don’t have to pay as much attention to how many users you have, very helpful when you are working with a company of 100-200 people. The Cloud seems like a shiny new way to run your business, but it is important to take the time to sit down with your IT professionals and really discuss what your company needs and goals are. You might be surprised and find out that a Cloud-based solution isn’t actually right for you. Do you use the Cloud for your business? How? If not, why not? Tell us in the comments!